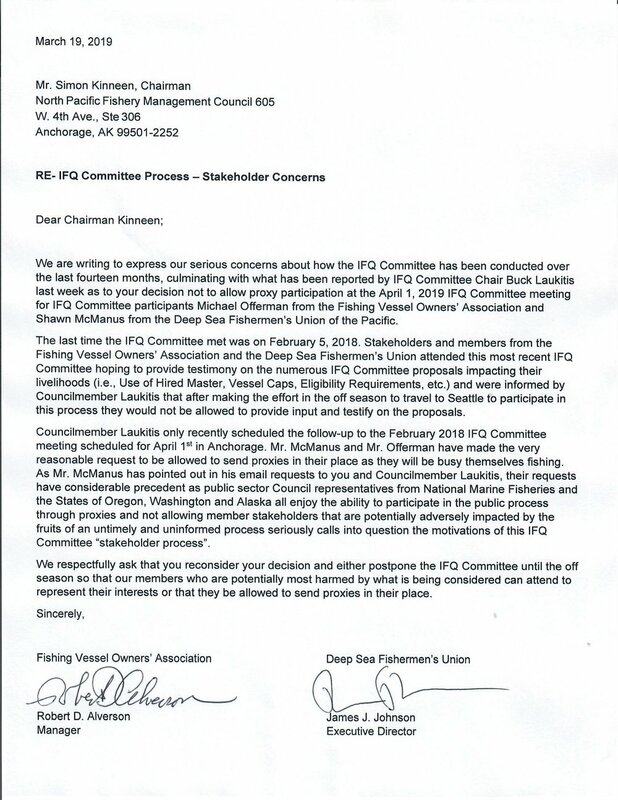 Despite what we believe to be a reasonable request of North Pacific Fishery Management Council Chair, Simon Kinneen, the Deep Sea Fishermen’s Union and Fishing Vessel Owners’ Association (FVOA) stakeholder participants were not allowed to send alternates to the April 1, 2019 IFQ Stakeholder meeting in Anchorage. The last time the IFQ Committee met was on February 5, 2018 and now we have been denied the opportunity to provide testimony on the numerous IFQ Committee proposals impacting our livelihoods (i.e., Use of Hired Master, Vessel Caps, Eligibility Requirements, etc.) since our representatives will be out fishing! Please see the joint letter below from the Union and FVOA calling into question the motivations of this IFQ Committee “stakeholder process”.